Boiler MACT. Portland Cement MACT. International 40CFR60 requirements. Specific permit reporting requirements. They’re all a distraction from the main business purpose of your facility- making product. You need a system that automates as much of the data collection, quality assurance, and reporting, while still providing you immediate notification of sensor malfunctions. AirVision™/CEM is specifically designed to meet these needs. With its Automatic Data Validation Processor (ADVP), AirVision ™ can both make necessary data/flag adjustments and provide notifications for the most important data conditions via e-mail. Standard reports can be automatically emailed to your desktop or PDA every day for quick reviews. Upgrading your existing DAHS is very easy- we can tie into most plant and CEM equipment via serial or Ethernet digital interfaces, and support legacy analog/discrete connections where necessary. Experienced Agilaire engineers will set up your system based on internal requirements and permit requirements to make an easy, turnkey transition. 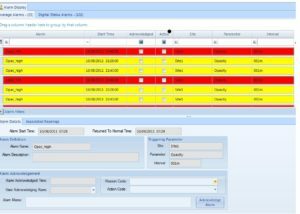 The intuitive interface in AirVision ™/CEM will ensure an easier, less cumbersome work process to get your compliants report out on time, with confidence. For sources with both source and ambient reporting requirements, AirVision ™ is especially convenient because a single server can meet all of the facilities reporting requirements in one convenient, consistent interface. The new Portland Cement MACT requirements involve some very specific methods of calculations that older DAHS systems generally can’t handle or would require extensive modification, such as the need for the 7-day and 30-day rolling averages to be based on 15-minute input data, rather than the hourly / daily averages normally associated with older 40CFR60 requirements. The need to distinguish startup/shutdown data into each of the rolling average buffers is especially critical. Don’t fail a future data audit that casts years of data into question by trying to adapt your old 40CFR60 system. Find out what AirVision ™/CEM can do for you. AirVision ™/CEM supports the specific data handling and reporting requirements for Alberta sources as well. For more information download the brochure; or a demonstration contact us.